So I have been a little sporadic with my posting and because of that I missed my year blogiversary. I hit 1 year July 24th! Wow! What a year. Ha ha!! Not sure I have given myself a break or fixed my procrastination problem but I definitely have connected with people. 243 plus people to be exact. Wow! I know that so many other bloggers that started the same time as me or even after have about 5 times as many followers. But I am blown away that there are 243 people who want to hear what I have to say! Crazy! So thanks to all of you for following along while I stumble my way through this blogging adventure. You guys are what keeps me wanting to write, craft, crack jokes, etc. Thanks for all your support, humor, and most of all love. Big virtual hugs to you all. Or for you non-hugger types, high fives! I love to make people laugh, not sure if I am that successful but I crack myself up. And what I find hysterical most find a little juvenile. Whatevs, talk to the hand. 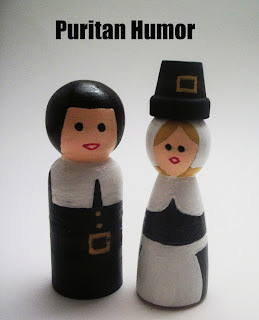 ;) I was taking pics of these hand painted pilgrims and for some reason the idea to make a little skit popped in my head. I swear I was not drinking. I am like this sober. I thought I was so clever. Actually I still do. Maybe a sequel this November??? Happy Blogiversary! So glad we "met" in cyberspace :) I think you are really funny, and I totally get your sense of humor. So either we're both lame or awesome...I choose awesome! Here's to another great year! Your sense of humor ROCKS! Happy Blogiversary...so glad we are friends ... :)PS You are very, very clever--no doubt! Ohmygosh I love your first evah post!!!! Happy bloggy-versary! =) I'm about to celebrate mine in a week! we're bloggy bday twins almost!!!! Hooray!!!!!! I had no clue your blog was so young!!! Congrats on building it up so much in the past year- quite a feat! Of course, why wouldn't someone want to read your blog??? Its pretty fab!!! Happy Blog-o-versary. congrats on the bloggiversary! You've come a long way! Happy one year! 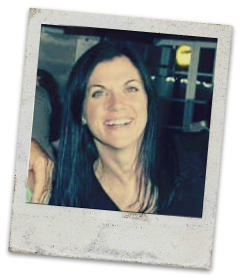 So glad to have met you and I thoroughly enjoy your blog! Can't wait to see what the next year brings. Happy Blogiversary! I guess that means I am right behind... better look into that... LOL. COngrats and keep up the good work! I remember that first post well :) Congrats on reaching the one year mark. Can't wait to see what you have in store for us in the future, Andi. That's so adorable - I love how you added your first post! I saw your comment on Meri Goes Round's blog and saw that you're from DC! I've been living here for the past 3 years and I really love it here.